Entering St Petersburg via train. There are men from the Third Section in the next car­riage and I think I might need to jump off. Cut to yes­ter­day after­noon, when I uploaded the final ver­sion of The Amber Rooms to the Kindle store. I still can’t quite believe that the book is out in the world and no longer in my head. For the past five years (begin­ning drafts in 2007), I used most of my spare brain power—and some that wasn’t spare—to fig­ure out solu­tions to plot and char­ac­ter­isa­tion prob­lems. Now, I get my even­ings and week­ends back. 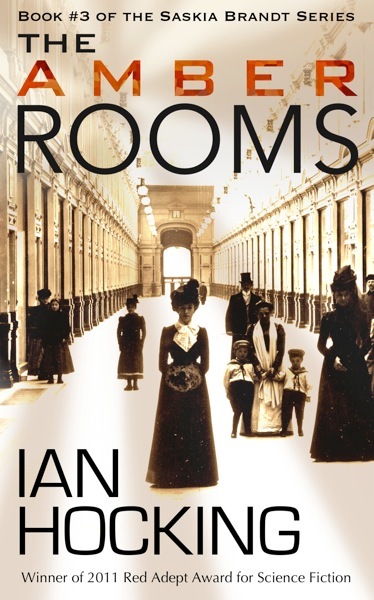 You can down­load The Amber Rooms from the UK or US Amazon stores. Until 25th December, books one and two are free. Cut to 1907, night, and a train approach­ing St Petersburg. On that train, Saskia Brandt is run­ning for her life. This is excel­lent news, I’ve been wait­ing for this to be released. Now I’ve got it and all I need is to get through the books I got for Xmas (hello 2014!) and I can get stuck into Saskia’s latest adven­ture! Glad you’re look­ing for­ward to it! Many thanks for the com­ment and best wishes for the New Year.